Thoroughly enjoyed the Christmas Concert and I do think you could raise the price on your tickets without any problem. A lovely afternoon and the refreshments were good as well. Thanks again. "What a wonderful concert this afternoon! Can't believe how intricate some of the arrangements were - well done! I know how difficult it must have been to learn the rhythms and words and have all the parts fit together. Very impressive! We really enjoyed the program and especially enjoyed the familiar ones with the beautiful arrangements. Congratulations to Patricia and choir! Oh...and to the little elf too - so cute! ...And what a surprise to win the door prize! Thank you AC+ for the Thrifty Foods gift card - it is much appreciated. A perfect gift! Looking forward to your upcoming events next year! P.S. BTW the men's red ties looked fabulous!" "I attended the Concert last Sunday at the Nanaimo Golf Club. It was a great afternoon and we enjoyed the varied program so much. A good way to spend a Sunday afternoon. I am looking forward to your fall program." "I really like this venue, and am looking forward to coming to your next concert. Thanks for a wonderful evening." "I thoroughly enjoyed the concert last night. Such a wonderful trip down memory lane...I was impressed with the variety of tunes - many of them so difficult to sing, and often performed a cappella! An amazing amount of work went into learning the music - and the animated singing was so much fun to watch. 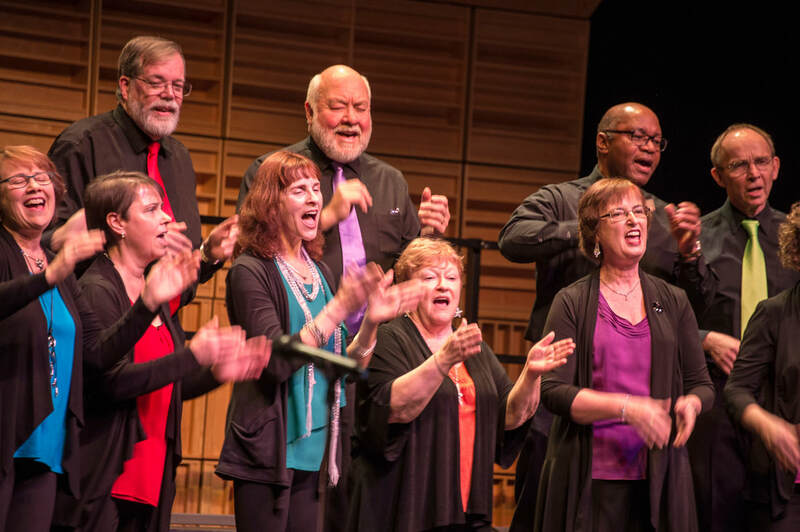 The audience could tell that this choir really enjoyed performing this program." "Good morning Patricia and all you lovely AC+ choirlings, I just want to let you know how much Judy and I enjoyed your presentation last night. It was a resounding success! We loved the concept you had for the concert, the amount and range of musical material, the happy juxtaposition of whole choir and small group performances, and in general the sheer quality of your sound. We knew most of the songs you sang, which added to the enjoyment of your presentation - great entertainment. The addition of some of Rick's students in the final two numbers made for a terrific conclusion (And it's clear your students love you, Rick). I think you have all come a long way as a singing group in the past year - lovely choreographic touches, and much humour. So thank you all for a terrific evening's entertainment - absolutely worth every penny!!! For sure we'll see you in the Fall at your next concert." "I've been meaning to email you all week Trish but it's been a crazy one with the snow. Anyway, I wanted to share something with you about the wonderful show last weekend. Dad had been asleep all day Saturday and all of Sun. till around 1. I'm sure you noticed he wasn't himself when he came, very tired and pale and just out of sorts. When he got up the next morning, he was like a new man. He was cheeky and sassy and the 'Grandpa' that everyone knows and loves. He's on a new drug for what they have discovered is diabetic neuropathy so I said "Oh, your legs must be feeling great today" and he said "Yeh, they are." But what came next is what I wanted to share. Dad said "It's not just me legs, I feel so good today within myself. And I know what it's from. It's from going out yesterday afternoon and spending time with people and sitting listening to those beautiful voices." I tell you Trish he enjoyed himself so thoroughly, he has been uplifted all week long. Again, as we have discussed so often my friend, it continues to astound me how powerful music can be. He felt so great on Monday, he was with me at NBES after school and I made him go in to see Colleen (who was also at the concert) so she could see the transformation as I knew she was concerned on Sunday. He gave her a big hug and was teasing her as always and all because of a couple of hours listening to music that he so greatly enjoyed. I can't thank you enough for the gift you and A Cappella Plus give to the world, and especially to my dad, it was so great to have him back again. I think it was a particularly powerful performance because there were two moments when I realized I had welled up and had tears rolling down my face. It was just so moving." "I can't sing but.. if I could, yours is the choir that I would want to join! You sound wonderful and you look like you are enjoying it so much." "I just wanted to let you know how much I enjoyed your performance on Sat! This one was truly special. You sounded fantastic and everything seemed so polished. The instrumentalists added greatly to the program as did the choreography. You ladies stole the show with "Wash". I was spellbound by the Butterfly song. Superb!!! All in all, a most entertaining performance!" "It was great to see Rick play the trumpet so sweetly and musically. I meant to congratulate him but missed seeing him afterwards. Please pass on my congrats to him and also to the other instrumentalists. That was lovely tribute/thanks to all of you by Patricia - it is very clear what a collaborative and creative ensemble the choir is. I loved the ladies Wash that Man out of my hair- very funny and cute." "Enjoyed the music immensely, especially Unchained Melody. I'm still humming it as well as We've Only Just Begun. An enjoyable mixture of music. Kudos and thanks for letting me know." "Thanks for a fun concert this afternoon! Everyone was enjoying the concert and you were too." "Just want to tell you what a great concert you presented yesterday. I loved the repertoire and of course the sound was excellent – nice blend of voices. I also enjoyed seeing some young faces up there with you. I’ve never been to an event in the Port lobby and liked it a lot. It was quite informal and we were close to the singers which was good. 2 pm at the Port was a good time for me. Keep up the good work." "I thoroughly enjoyed your concert tonight. What a wonderful, diverse selection of music. Well done! :)"
"I so enjoyed watching and it was exciting to see there has been much progress with memorizing, choreography and even theatrical flare. So entertaining!" "A Cappella Plus just keeps getting better and better! Your sound is so professional and your presentation is so entertaining. You should go on tour." Congratulations to Patricia and all of your choir members for a very enjoyable evening. And, as usual, the yummy appies and bar service were much appreciated. We love this venue..."
"It was such a treat seeing you all last night although I think I got the best deal of anyone as I was able to attend the rehearsal on Saturday and I got to witness the wonderful camaraderie of your group. I so enjoyed last night's show and my dad thought it was the best night out he's had in years. You'll certainly see us both again at future shows." "Your concert was great Lonnie. You guys are amazing and so versatile. Loved the venue too!" "Lynne said it was just fabulous. She was a bit late but she said it was so enjoyable and she loved the venue !!!"